A Little Rescue Goes a Long Way When Citizens Gather and Stand Together Behind a Cause. Sometimes it’s the little things that matter in life, and the caring actions of many, that just make a pleasant difference on our world. Sometimes it’s the little things that matter in life, and the caring actions of many, that just make a pleasant difference on our world. In this case, it was four tiny little kittens that “took a village” to capture when a local man (address not released) later identified as John Rountos, decided to dump four kittens and and a mother cat in the woods without food, water or shelter, behind a local Bethel business one afternoon. He did this thinking it was helping these cats eventually find a home, he later said. 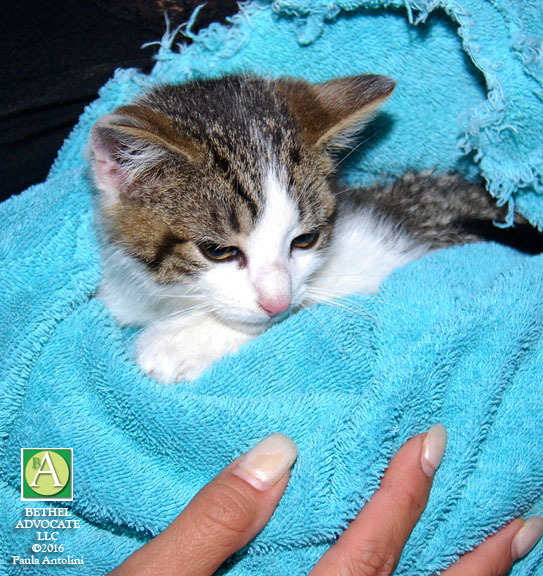 Many citizens, once they heard about his actions, disagreed, and thought it was wrong to abandon live animals, and especially little kittens in this manner, and it is in fact, against Connecticut state law. They did not feel these were feral cats as Rountos claimed. It was an average day in Bethel Connecticut when business owner Bob Craybas spotted something suspicious as he was driving into the parking lot behind his Gift Cottage store at 154 Greenwood Avenue on May 10, 2016. Craybas owns the Gift Cottage with his parents Larry and Joan Craybas and his sister Terri Craybas, who also became concerned about the kittens once they became aware of the situation. 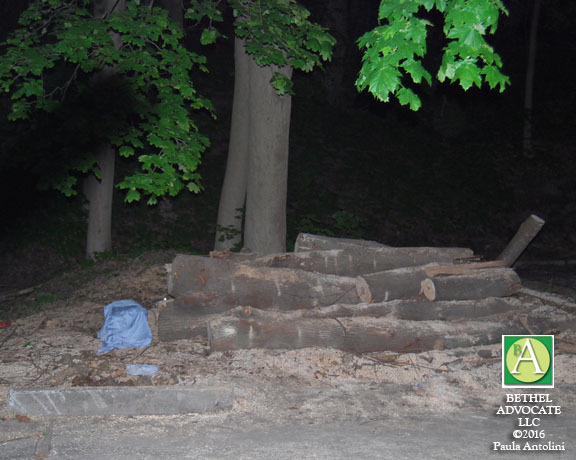 Photo above: Woods behind the Gift Cottage showing the trap (covered in blue cloth) placed there by Teresa Fogel, in the area near the logs where the kittens and mother cat were released by John Rountos in the rear of the parking lot behind the store. 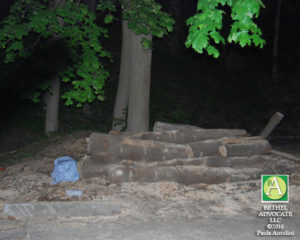 Bob Craybas saw a van parked towards the back of the lot, he said, and he thought at first perhaps the driver was stealing some logs that were back there. But upon pulling up beside Rountos’ van he suddenly saw kittens running into the woods from under the Rountos van. Craybas called police and stood there with Rountos until police arrived. According to a Bethel Police report, at approximately 1:oo p.m. on May 10, 2016, Bethel Animal Control Officer Steven Shanley was dispatched to investigate someone releasing three cats at the complainant’s business. According to the report, Officer Shanley said, “I explained to Rountos that by releasing the cats he violated Connecticut’s Animal Cruelty statute by not providing them with proper care and abandonment. Rountos understood the law and stated he will not trap or release any more feral cats. Since the cats were feral I issued a verbal warning for Cruelty to Animals 53-247(a).” … “This officer followed up with Craybas to inform him if the cats return to his property and cause a nuisance to contact animal control. CASE CLOSED,” the report reads. The Connecticut State Statute for Cruelty to Animals CGS § 53-247(a) prohibits people from overdriving, overloading, overworking, torturing, depriving of substance, mutilating, cruelly beating or killing, or unjustifiably injuring any animal. If impounding or confining an animal, it prohibits (1) failing to provide it proper care; (2) neglecting to cage or restrain it from injuring itself or another animal; or (3) failing to supply it with wholesome air, food, and water. The statute also bans unjustifiably administering or exposing a domestic animal to any poisonous or noxious drug or substance intending that the animal will take it. Individuals in custody of an animal may not act cruelly to it; fail to provide it with proper food, drink, or shelter; abandon it; or carry or cause it to be carried in a cruel manner. Fighting with or baiting, harassing, or worrying an animal to make it perform for amusement, diversion, or exhibition is also prohibited. These offenses are punishable by a fine of up to $1,000, imprisonment of up to one year, or both. 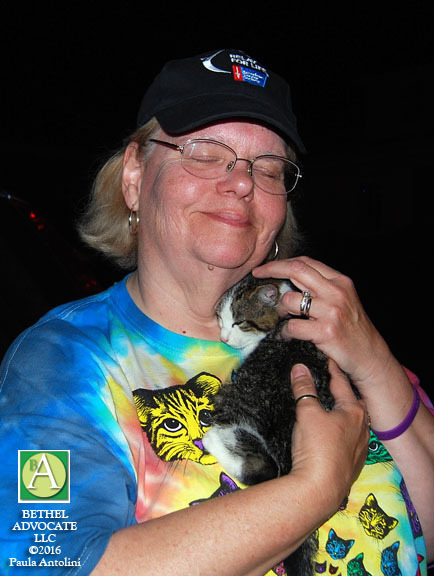 Photo above: Teresa Fogel cuddles first cat that was rescued. 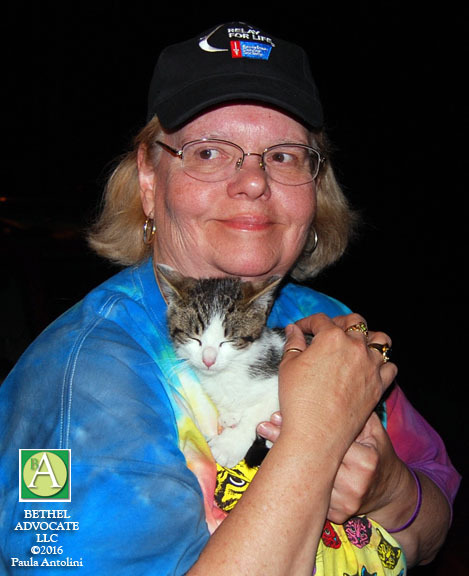 Bethel resident and animal lover Teresa Fogel, who is also a Bethel Community Emergency Response Team (CERT) Coordinator, Bethel’s Connecticut State Animal Response Team (CTSART) Leader, Red Cross volunteer, and Relay For Life volunteer, saw the online post by Terri Craybas and drove to the location behind the store to try and find the cats. She then took action and drove to the Danbury Animal Welfare Society (DAWS) on Grassy Plain Street and obtained a trap (does not hurt animal, just captures them) and brought it back to the location where the cats were last seen. She paid $75 deposit to do so, and was responsible for the trap should someone steal or damage it. By now neighbors who live near the Gift Cottage also heard about the missing cats and started checking the woods and trap often. Fogel also drove back many times to check too, and eventually by the second day was losing hope that the young kittens were alive without food, she said. Bob Craybas felt the need to warn some drivers in the Gift Cottage parking lot to be careful when they moved their cars for fear a kitten might be in the area, and sure enough, when one woman started her car a kitten ran out from the wheel well. That kitten was eventually captured by hand in the front yard of the store, by a neighbor, who also became involved in the search, along with many of her family members who kept monitoring the woods too, looking for the cats for two more days. 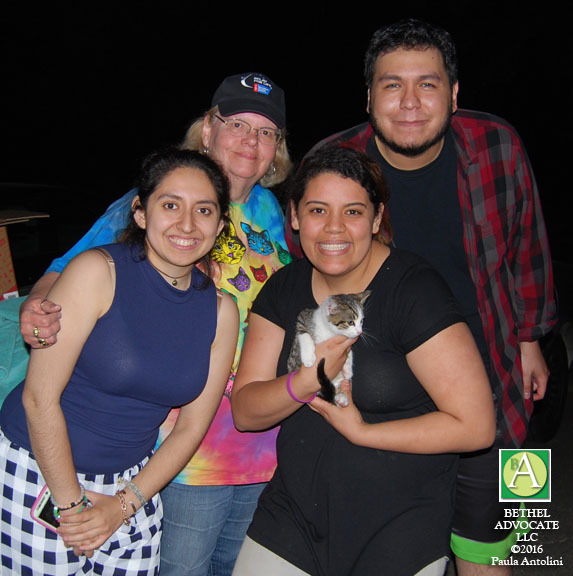 Besides the four Craybas family members and Teresa Fogel helping to rescue the cats, neighbors that kindly helped were Bethel residents Nathaniel Ramirez and his cousin Tiffany Zapata, and Tiffany’s mother Terry Zapata, and Maya Fonseca who was visiting from Danbury. Photo above: Teresa Fogel (upper left) with some of the neighbors who helped with the rescue, Nathaniel Ramirez (upper right), Tiffany Zapata and Maya Fonseca. The other three kittens were eventually caught in the trap but the mother cat is still loose and has not been seen again so far. One neighbor ended up keeping one kitten and the other three kittens went home with Fogel overnight, sleeping in a portable kennel cage, and she brought them to DAWS in the morning. 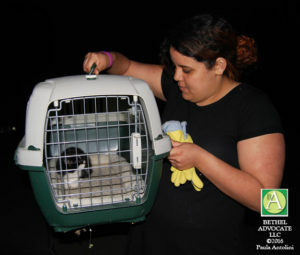 Photo above: The second kitten that was rescued is shown in a portable carrier. Had a number of people not sprung into immediate action the outcome would likely have been grim for these little ones. The diligence of Fogel kept the search going, she just would not give up until the kittens were found. It took a lot of concerned citizens all working together for days to rescue these kittens but this story had a happy ending. They are hoping the mother cat was taken in. If you have the mother cat please let us know, and thank you for rescuing her. Please know: if you have or find animals that you do not wish to keep, there are many rescue organizations in our area willing to accept the animals and you can also contact animal control officers in every town, or local police. Do not abandon animals. Thank you to all these kind citizens who decided to take action. I simply want to mention I am new to blogging and truly liked your web site. Probably I’m likely to bookmark your blog . You actually come with remarkable articles and reviews. With thanks for revealing your website. Imagine if you could have a sports betting system that can be absolutely profitable. Check out the link here to learn more. Can I simply say what a relief to find someone that genuinely understands what they are discussing on the web. You definitely know how to bring a problem to light and make it important. More and more people need to check this out and understand this side of your story. I was surprised you’re not more popular given that you definitely possess the gift. If you desire to improve your knowledge just keep visiting this site and be updated with the most up-to-date news update posted here. on your augment and even I success you get admission to consistently quickly. Hi there to all, how is the whole thing, I think every one is getting more from this web page, and your views are good designed for new viewers. website with us so I came to look it over. I’m definitely loving the information. I’m bookmarking and will be tweeting this to my followers! I would like to thnkx for the efforts you have put in writing this site. I’m hoping the same high-grade web site post from you in the upcoming as well. Actually your creative writing skills has encouraged me to get my own blog now. Really the blogging is spreading its wings rapidly. Your write up is a good example of it. I was just searching for this info for some time. After six hours of continuous Googleing, finally I got it in your website. I wonder what is the lack of Google strategy that don’t rank this kind of informative web sites in top of the list. Usually the top web sites are full of garbage. Thank you for sharing excellent informations. Your site is so cool. I’m impressed by the details that you have on this site. It reveals how nicely you understand this subject. Bookmarked this web page, will come back for more articles. You, my pal, ROCK! I found simply the info I already searched everywhere and just could not come across. What a great web-site. I as well as my buddies have been looking through the excellent tips and hints from your web blog and all of a sudden developed a horrible feeling I never thanked the website owner for those tips. My people ended up excited to read through them and now have extremely been loving them. Appreciate your being simply considerate as well as for obtaining variety of notable ideas most people are really desperate to understand about. Our own sincere regret for not expressing gratitude to you earlier. extensive for me. I’m having a look forward for your subsequent put up, I will attempt to get the cling of it! you’re in point of fact a good webmaster. The web site loading speed is amazing. It sort of feels that you’re doing any distinctive trick. In addition, The contents are masterpiece. you have done a magnificent job on this topic! I was just seeking this information for a while. After six hours of continuous Googleing, finally I got it in your site. I wonder what’s the lack of Google strategy that do not rank this type of informative sites in top of the list. Normally the top sites are full of garbage. Great amazing issues here. I am very glad to peer your post. Thank you a lot and i am having a look forward to contact you. Will you kindly drop me a mail? Hi there, I found your site by way of Google whilst searching for a comparable topic, your site came up, it seems great. I’ve bookmarked it in my google bookmarks. obviously like your web-site but you need to test the spelling on quite a few of your posts. Several of them are rife with spelling issues and I find it very troublesome to inform the reality then again I¡¦ll certainly come back again. Great awesome things here. I am very happy to peer your post. Thanks so much and i’m looking forward to touch you. Will you kindly drop me a mail? I would like to thank you for the efforts you have put in writing this blog. I am hoping the same high-grade web site post from you in the upcoming as well. In fact your creative writing abilities has encouraged me to get my own blog now. Actually the blogging is spreading its wings rapidly. Your write up is a great example of it. Generally I do not read post on blogs, but I would like to say that this write-up very pressured me to try and do so! Your writing taste has been amazed me. Thanks, quite great article. Thank you for any other informative web site. Where else could I am getting that type of information written in such an ideal method? I have a project that I am just now working on, and I’ve been at the glance out for such info. Great post. I was checking constantly this blog and I am impressed! Very useful information specifically the last part 🙂 I care for such info a lot. I was looking for this certain information for a long time. Thank you and best of luck. My wife and i have been quite thankful when Albert could complete his survey through the precious recommendations he got from your web pages. It’s not at all simplistic to simply find yourself offering helpful hints that many people have been making money from. So we fully understand we have you to thank for that. The illustrations you made, the straightforward web site menu, the friendships your site help instill – it’s got everything unbelievable, and it’s really aiding our son and us reckon that the concept is cool, and that is exceedingly serious. Many thanks for all! Whats Happening i’m new to this, I stumbled upon this I have found It absolutely useful and it has aided me out loads. I am hoping to give a contribution & assist different users like its helped me. Good job. Great tremendous things here. I am very satisfied to see your post. Thanks so much and i am having a look ahead to touch you. Will you kindly drop me a e-mail? I¡¦m no longer certain where you are getting your info, however good topic. I needs to spend a while learning more or figuring out more. Thanks for fantastic information I was in search of this info for my mission. great submit, very informative. I’m wondering why the opposite experts of this sector do not understand this. You should proceed your writing. I’m sure, you have a huge readers’ base already! hi!,I really like your writing very much! percentage we be in contact more approximately your article on AOL? I require a specialist on this space to solve my problem. May be that is you! Having a look ahead to look you. Hello, Neat post. There’s a problem along with your site in internet explorer, might test this¡K IE still is the market leader and a big part of other folks will miss your magnificent writing due to this problem. I’m writing to let you be aware of of the helpful encounter my princess had checking your web site. She realized a lot of issues, with the inclusion of what it is like to have an ideal teaching character to make men and women just comprehend some tricky subject areas. You actually did more than her expected results. Many thanks for churning out those warm and helpful, trustworthy, revealing and also cool guidance on the topic to Evelyn. Great tremendous things here. I¡¦m very satisfied to see your article. Thank you so much and i am looking ahead to contact you. Will you kindly drop me a mail? Thank you for every other informative blog. Where else may just I get that kind of info written in such an ideal method? I have a project that I’m simply now operating on, and I have been at the glance out for such information. Great tremendous issues here. I am very happy to see your post. Thanks so much and i’m looking forward to contact you. Will you kindly drop me a e-mail? Good morning here, just got alert to your blog page through yahoo, and realized that it is seriously educational. I’ll value should you decide retain this post. I will immediately seize your rss as I can not find your email subscription hyperlink or e-newsletter service. Do you have any? Please let me understand so that I may subscribe. Thanks. Thank you a bunch for sharing this with all of us you really recognize what you’re talking about! Bookmarked. Please also seek advice from my web site =). We can have a hyperlink exchange contract between us! I’ve been browsing online more than 3 hours today, but I never found any interesting article like yours. It is lovely value enough for me. Personally, if all website owners and bloggers made just right content as you probably did, the internet will probably be a lot more useful than ever before. Hello, Neat post. There is a problem along with your site in web explorer, would test this¡K IE still is the marketplace leader and a good section of other people will miss your great writing because of this problem. Hi There! We are looking for experienced people that might be interested in from working their home on a full-time basis. If you want to earn $200 a day, and you don’t mind writing some short opinions up, this might be perfect opportunity for you! Simply click the link here NOW! Hello, Neat post. There’s an issue together with your web site in web explorer, could check this¡K IE nonetheless is the marketplace leader and a large portion of other people will pass over your great writing because of this problem. Whats Going down i’m new to this, I stumbled upon this I’ve found It positively useful and it has aided me out loads. I hope to give a contribution & assist other users like its aided me. Good job. Wow, incredible blog format! How lengthy have you been running a blog for? you make blogging glance easy. The entire look of your web site is great, let alone the content material! Great ¡V I should certainly pronounce, impressed with your web site. I had no trouble navigating through all the tabs and related information ended up being truly easy to do to access. I recently found what I hoped for before you know it in the least. Quite unusual. Is likely to appreciate it for those who add forums or anything, site theme . a tones way for your customer to communicate. Nice task..
Great goods from you, man. I have understand your stuff previous to and you’re just too excellent. I actually like what you’ve acquired here, really like what you are stating and the way in which you say it. You make it entertaining and you still take care of to keep it sensible. I can’t wait to read far more from you. This is really a wonderful site. Helpful information. Lucky me I found your site accidentally, and I am surprised why this coincidence didn’t happened in advance! I bookmarked it. Thanks so much for giving everyone remarkably terrific opportunity to check tips from here. It’s usually very fantastic and full of fun for me personally and my office fellow workers to search your blog on the least three times weekly to find out the latest things you have got. And lastly, I am usually amazed with your powerful information you give. Certain 2 facts in this post are particularly the most beneficial we have ever had. Wow, fantastic blog layout! How lengthy have you been running a blog for? you made blogging look easy. The overall look of your site is great, as smartly as the content material! Simply wish to say your article is as astounding. The clearness in your post is simply nice and i can assume you’re an expert on this subject. Fine with your permission allow me to grab your RSS feed to keep updated with forthcoming post. Thanks a million and please continue the gratifying work. Hello my friend! I wish to say that this article is awesome, nice written and come with approximately all vital infos. I would like to peer extra posts like this . Great goods from you, man. I have understand your stuff previous to and you are just extremely fantastic. I really like what you’ve acquired here, really like what you are stating and the way in which you say it. You make it enjoyable and you still take care of to keep it smart. I cant wait to read much more from you. This is really a wonderful website. hey there and thank you for your information – I have certainly picked up something new from right here. I did however expertise some technical issues using this web site, since I experienced to reload the site many times previous to I could get it to load properly. I had been wondering if your web hosting is OK? Not that I’m complaining, but sluggish loading instances times will sometimes affect your placement in google and can damage your high quality score if advertising and marketing with Adwords. Anyway I am adding this RSS to my email and can look out for much more of your respective interesting content. Make sure you update this again soon.. Useful information. Fortunate me I found your website accidentally, and I’m stunned why this accident didn’t happened earlier! I bookmarked it. you are really a just right webmaster. The website loading velocity is incredible. It sort of feels that you are doing any unique trick. Also, The contents are masterwork. you have done a excellent task on this topic! I am no longer positive where you are getting your information, however great topic. I must spend some time learning more or understanding more. Thanks for great info I was on the lookout for this information for my mission. Thanks for another fantastic article. The place else could anybody get that type of info in such an ideal approach of writing? I’ve a presentation subsequent week, and I am on the search for such info. If you wish for to increase your familiarity just keep visiting this website and be updated with the most recent information posted here. Good day very cool website!! Man .. Excellent .. Amazing .. I’ll bookmark your blog and take the feeds additionally¡KI’m happy to seek out so many useful information here within the publish, we’d like develop extra strategies in this regard, thank you for sharing. . . . . .
Whats Taking place i’m new to this, I stumbled upon this I’ve discovered It positively helpful and it has helped me out loads. I hope to give a contribution & aid other users like its aided me. Great job. I¡¦m not sure where you’re getting your info, however good topic. I must spend a while studying more or understanding more. Thanks for wonderful information I was looking for this information for my mission. Hi, Neat post. There is an issue with your website in internet explorer, would test this¡K IE still is the marketplace leader and a big portion of folks will leave out your fantastic writing due to this problem. Thanks for every other magnificent post. Where else could anybody get that type of information in such an ideal approach of writing? I’ve a presentation subsequent week, and I am at the search for such information. I¡¦m now not positive the place you’re getting your info, but good topic. I needs to spend some time finding out more or working out more. Thank you for excellent information I was on the lookout for this info for my mission. I and also my buddies came studying the good procedures from your web site and then quickly I got an awful suspicion I never thanked the blog owner for them. The men are already for that reason thrilled to study all of them and have truly been taking advantage of them. I appreciate you for truly being really accommodating and for making a decision on variety of good issues millions of individuals are really wanting to learn about. My honest regret for not expressing gratitude to earlier. Thank you for each of your labor on this web site. Debby really loves carrying out investigations and it’s easy to see why. A number of us know all relating to the dynamic method you render very helpful tactics through the web blog and improve response from some others on this topic while our girl is really studying a great deal. Have fun with the rest of the year. You have been doing a good job. It¡¦s in point of fact a nice and useful piece of information. I¡¦m satisfied that you just shared this helpful information with us. Please keep us informed like this. Thanks for sharing. I and also my guys happened to be checking the best information located on your website and then before long came up with a horrible feeling I never thanked the site owner for those secrets. These people were definitely for this reason joyful to study them and have in effect sincerely been loving these things. Many thanks for indeed being quite helpful as well as for figuring out these kinds of brilliant subjects millions of individuals are really desirous to know about. Our honest regret for not expressing gratitude to you earlier. Thank you so much for providing individuals with an extremely memorable chance to read from this blog. It can be very ideal and packed with a lot of fun for me and my office mates to search the blog more than three times in one week to find out the latest issues you have got. Of course, I’m just usually motivated with your brilliant knowledge you serve. Some 2 tips on this page are clearly the most impressive I have ever had. I would like to thank you for the efforts you have put in writing this site. I’m hoping the same high-grade web site post from you in the upcoming also. Actually your creative writing abilities has encouraged me to get my own website now. Actually the blogging is spreading its wings fast. Your write up is a great example of it.